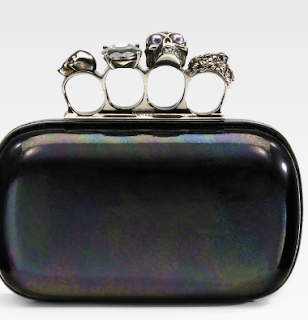 If I had pots and pots of money to spend, it is very likely that I would NEED* this Alexander McQueen Knuckle Duster Patent Leather Clutch. *Okay, I don't think I could ever justify buying a $1600 purse the size of a travel wipes case, no matter how stinking rich I was. But I do think it's super duper cute. Way cuter than those glittery Judith Leiber clutches that everyone seems to love. THAT is awesome. Completely awesome. I love it! oh... that is one bewitchin' purse. Glitzed my dear, glitzed. It would look good with just about anything! I don't think I could spend that much on a purse either but you gotta figure that we probably have spent that much on purses already. I guess it's poor planning and no foresight to have not saved for this event. That is a beautiful purse. Kinda on the small side for the money but so pretty. That IS cool. I hope some knock-offs come around soon. I like the use of silver instead of brass (knuckles)! One tuff purse! That would go over with the PTA heehee! 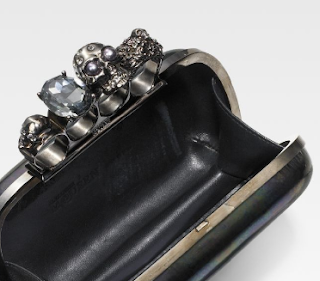 That is one way cool purse, but NO way could I spend that $$ - it's more than my mortgage payment. I agree that knock-offs would be great. Did I read correctly? $1600? Wow. I need to get out more often. I love that you could totally use it in a fight too.